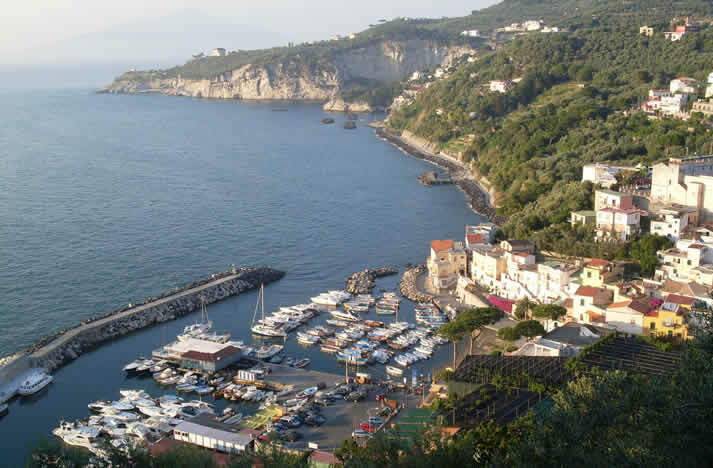 Marina della Lobra is located halfway between Sorrento and Capri (4 miles) in Massa Lubrense, in the heart of the Marina di Punta Campanella Reserve. The coast is characterised prevalently by limestone cliffs and small stretches of beach. Areas suitable for bathing are la scogliera di Marina della Lobra near the splendid seaside village and on the opposite the promenade made of rocks, where you can hire sun beds, deckchairs and sun umbrellas. A few metres from the beach is paid parking. Restaurants and bars a scattered everywhere for those who wish refreshment. The main attraction of the place is the colourful fishermen’s houses that decline down to just a few steps from the beach and some archeological remains that testify to the historical past of this marina. Finally, for an unforgettable experience, you can hire wooden goiters for a swim along the caves and ravines of the coast or dive underwater to the interesting natural sea bed area.